This is hopefully the first of a series of posts on DIY cosmetics. I want to take simple projects that are fun to do and give good results, and provide you with small tutorials on how to achieve them. Today I'm showing how to press loose powders of any type, be they matte, shiny, face or otherwise. The trick to this is not to use alcohol. Normally alcohol is recommended as it evaporates and makes it easier to get a perfect pressed shadow. Alcohol however reacts badly to certain types of powders, matte eyeshadows in particular. 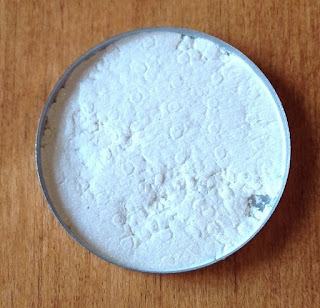 This post explains how to press a powder (in this case a highlighter for the face) without the use of alcohol. Alcohol is sometimes useful for pressing eyeshadows made of only mica, however if you don't know the ingredients or have eyeshadows that have iron oxides, ultramarine pigments, or other matte colourants then you need to not use alcohol or the shadow will turn into a hard rock that doesn't give any colour pay-off. 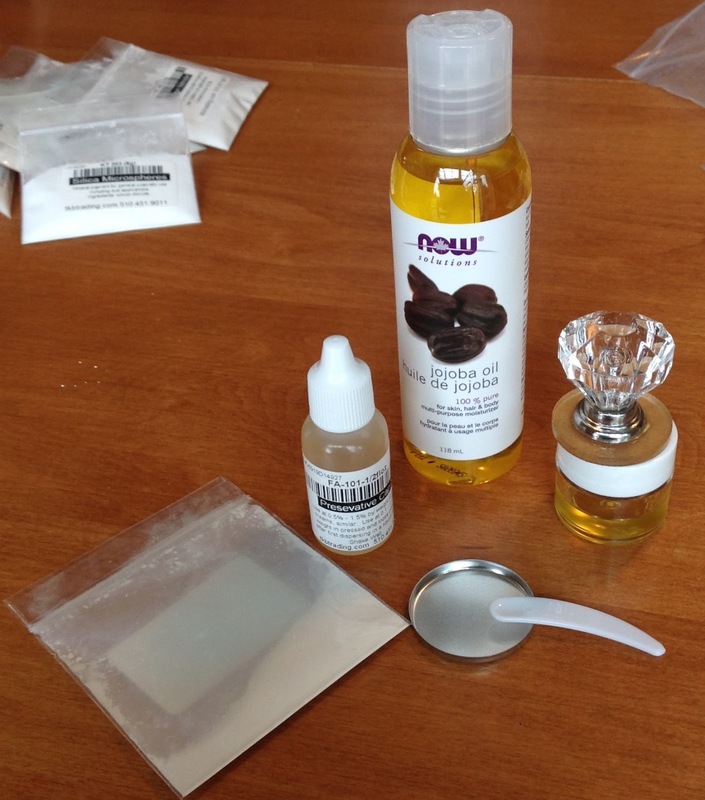 I purchased all of my supplies from TKB Trading or How to Make Cosmetics (except for the Jojoba oil). They're the same website, and I like how you can get small amounts to try for decent prices. The Jojoba Oil I got from a health food store. First you'll need a stable oil. I chose Jojoba because it has a long shelf-life and only rates a 2 out of 5 on the comedogenic scale. Coconut oil is also popular but it causes me to break-out so I used Jojoba. If you choose an oil that has a lower shelf life beware that the oil will go rancid over time as it reacts with oxygen. Another thing to keep in mind is that liquids can provide a perfect environment for mould. This is why you see a preservative pictured and listed in the needed items. You need hardly any, and the one I chose Cap-5 is safe for all cosmetic applications. It's paraben-free and formaldehyde-free. With the powder or eyeshadow you're pressing try to use formulated powders that have a base. Base powders help the eyeshadow stick together and adhere to your skin for better staying power. Loose pigments on their own will press but they likely won't preform well. So in the ingredients of the shadow or powder your pressing look for things like Boron Nitride, Magnesium Myristate, Zinc Stearate, etc. Most reputable indie companies will have this in their eyeshadows already. The first thing to do is mix the preservative together with the oil you plan to press with. Preservative Cap-5 is recommended at 0.1-0.2% in pressed powders and at 0.5-1.5% in liquid. You only need the smallest amount and I like to do this by counting the number of drops of liquid. So you need 1 drop of preservative to 99 drops of Jojoba oil for 1%. I recommend putting this into a small plastic jar and then tightening the lid and shaking to mix the two together after you finish counting. A little too much powder! Had to empty some so I didn't spill. 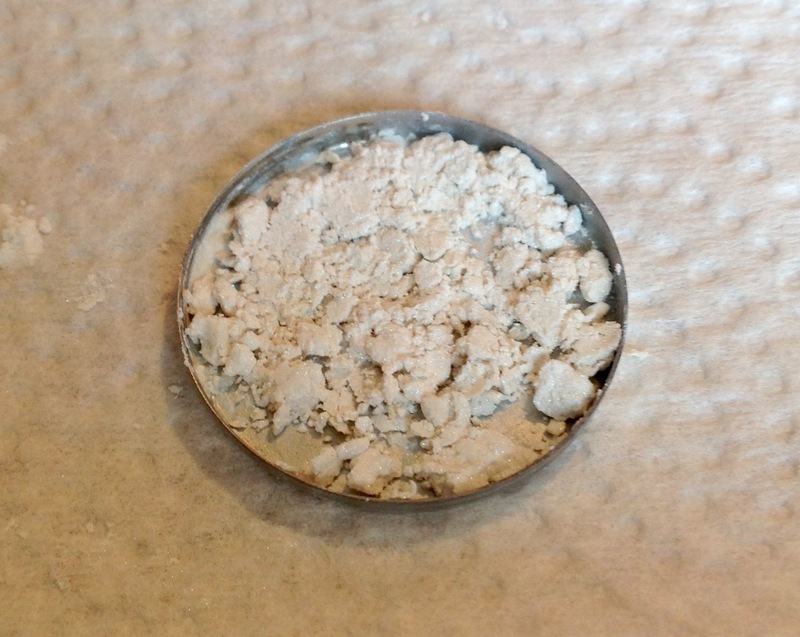 Next take the loose powder you are pressing and add an amount to the small bowl or empty loose powder container you're using. 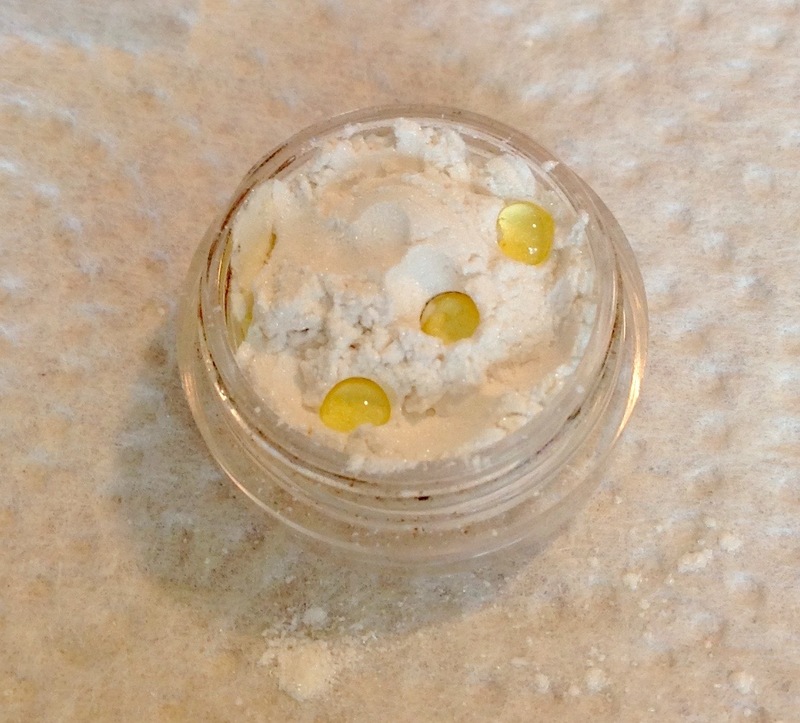 Take the oil/preservative mix and slowly add drops to the powder. Use your little scoop to carefully and evenly mix together. You're looking for a texture that's almost chunky. Where the powder is starting to stick together in flakes and bits. (Just make sure they're fully mixed and not dry on the inside). Take this mixture and spread into the pan. Now take your pressing tool and some paper towel. Place the paper towel over the whole pan and slot the pressing tile on the bottom of the tool into the top of the pan through the paper towel. Make sure you have it lined up properly. If you buy the tool from the same place as the pans you should have a perfect fit. If not make sure you purchase the same millimetre diameter tool and pans. Press down firmly and evenly (I recommend standing for this and bearing down from above). When you life the paper towel you should have a pressed pan. Like mine it may not be the prettiest in the world but that comes with practise. As you can see mine only fills the pan part way. You can leave it like this or add more powder/oil mixture on top and press again to fill it. 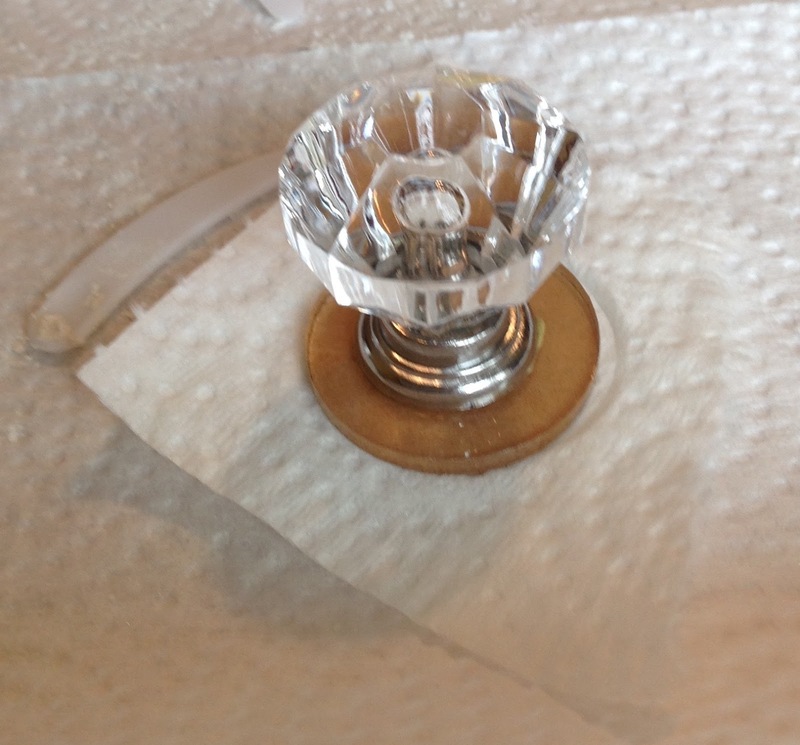 You can also press a couple of times with new paper towel each time to get more of the oil out of the powder. If you've got the correct consistency of pigment/ oil and pressed it properly it should be sturdy enough not to shatter if you drop it from a small height. It won't be as solid as purchased pressed products but it shouldn't be super weak either. Less is more! Do not over add the oil or you'll end up with a mess that won't ever dry out. Start off with way less oil than you'll need and slowly add more as needed. Feel free to press as many times as you like to get as much oil out of the eyeshadow as possible. You can't over-press, just remember to keep the pressure even when you press. That's it! A fairly simple way to press pigments. I hope this comes in useful for you, if not feel free to ask questions. Please let me know if you like the idea of DIY tutorial posts. Another helpful website for pressing matte eyeshadows is Lisa Lise Blog here, it gives a different perspective on the process if you're interested. Disclaimer: I purchased all these products myself. I am in no way affiliated with TKB Trading at this time.